Jemini Crafts: Really useful..... GRID PAPER ! Really useful..... GRID PAPER ! Yes - my product to share today is our fantastic pad of Grid paper, which comes in pad form and features Metric grids/rulers on one side and Imperial on the other. 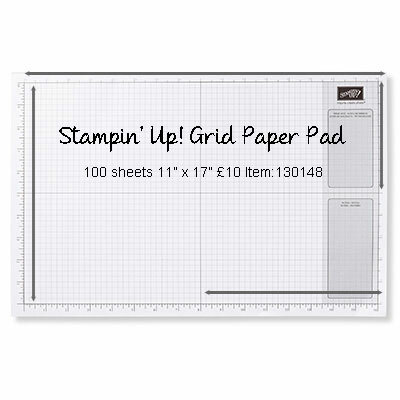 Obviously designing with stamping and crafting in mind, this grid paper is useful for all sorts of activities! From planning your kitchen layout, children's homework, measuring when you can't find that ruler... to testing your latest stamps and as a base layer to protect your best table! Anyone can order it - it's not just for Stampin' Up! team members! Just email me if you are local and want me to add a pad on my next order for you. OR add it to your next order when you order online.